Hello all! April here. I wanted to share a recap of this weekend’s fundraising events for Feeding Hope. To celebrate my 37th birthday, I decided to walk/jog 37 miles to raise money for property we’d like to purchase in Haiti for our program. These 37 miles are split up between 4 days. As some of you may know, we’re currently in a rented space and we’ve extended our lease there on a month-to-month basis. The goal is to have property purchased by the end of the year – that’s where this fundraiser comes in. We have secured the $15K down-payment and we’re currently raising funds for the $15K balance. Owning our own property in Haiti will be huge step in the right direction. The children will have much more room to play and we’ll be able to build as we see fit for years to come. The last two events in this fundraising series are next weekend – 9/16 & 9/17. A couple friends have said they’ll join which will be fun! This weekend was a big fundraising success and we’re hoping for the same next weekend. 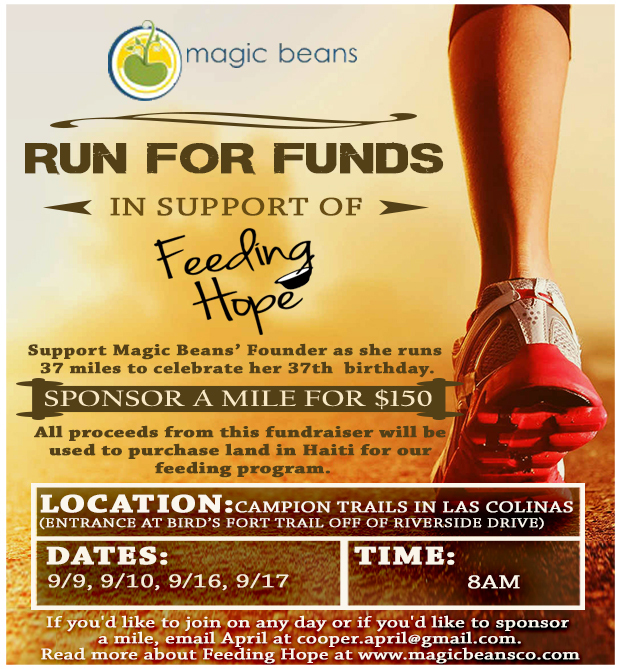 If you would like to join on either day to walk with us or if you’d like to donate for our land in Haiti, please visit www.magicbeansco.com. You can click the DONATE button and if you need more information about the walks next week, you can contact us through the website as well. My personal email is also listed below on the flyer. Please message me if you have any questions at all! April you are a great inspiration and should be very proud of yourself and all that is accomplished. Good luck on the remaining fundraiser and Walking the rest of your miles.